Carlos Reutemann was a great driver from the Argentine, winning 12 Grand Prix over an eleven year career and coming second in the World Championship in 1979, and third 3 times. 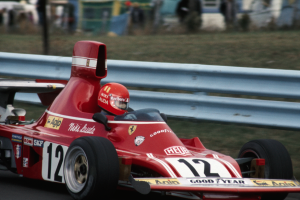 In terms of wins, 1978 was his best year when he won 4 races including Long Beach and Watkins Glen in the Ferrari 312. 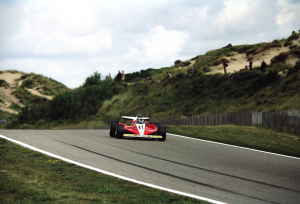 Here at Zandvoort in 1978 he finished seventh. When he retired from racing he returned to Argintina where he became a successful statesman. Photo taken on old backstretch, by the sand dunes between turns 6 and 7. Artist: Mike Gotwalt, Nikor F2, 135 mm lens. The Nurburgring is without question the greatest race track ever built. At 17 miles, the track offered so many challenges to the drivers that it was impossible to conquer the course. Just surviving was often enough. 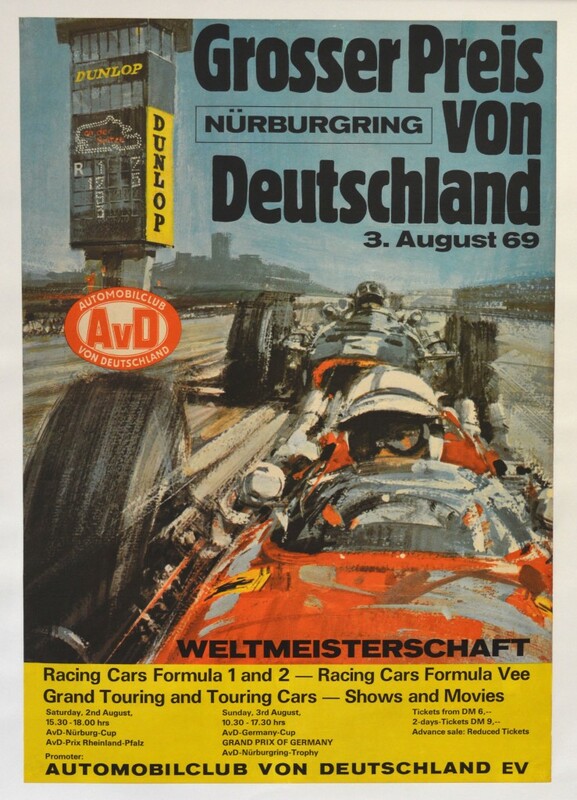 The 14 mile Nordschleifie was used in 1969 when the race was won by the modern master of the ‘Ring, Jacky Ickx driving for Brabham. This poster by Michael Turner was used for several years thereafter. It shows John Surtees in a Ferrari leading the BRM of Graham Hill down the main straight with the famous Dunlop scoring tower in the background. 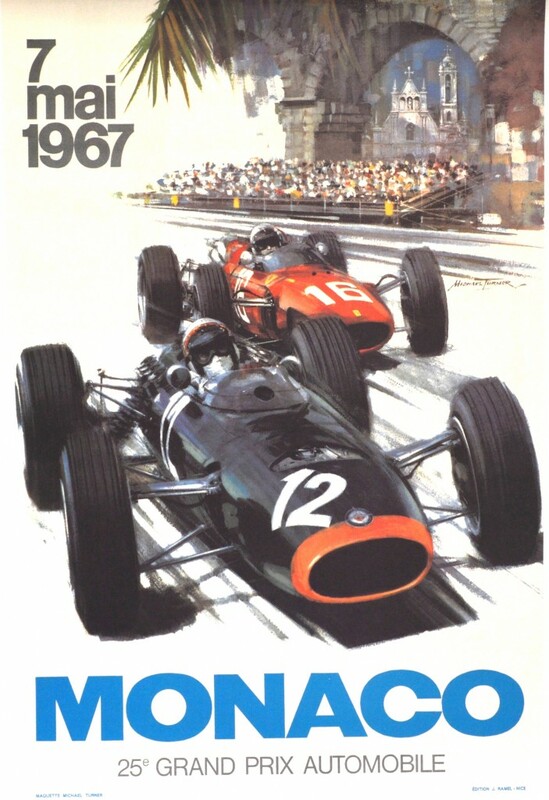 The poster for the 1967 Monaco Grand Prix highlights the 1966 race won by Jackie Stewart in a BRM, with Lorenzo Bandini in the number 18 Ferrari coming second. The 1966 race was the first under the new 3.0 liter engine size when revolutionized the sport. In the 1967 race tragedy struck when Bandini’s Ferrari crashed heavily resulting in his death days later. The 1967 race was won by Denny Hulme, driving a Brabham with an Oldsmobile engine. JYS would win a second Monaco Grand Prix in 1971 in the famous Cosworth Tyrrell.